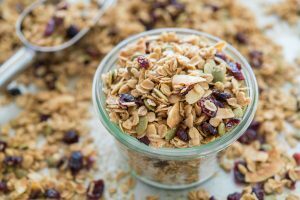 This quick recipe is great to sprinkle on yogurt or eat with milk! Enjoy! Preheat oven to 300 Fahrenheit. Place all ingredients in a bowl and stir to mix well with your hands or a spoon. Place a sheet of parchment paper on a baking sheet and spread mixture evenly. Bake for 10-12 minutes.